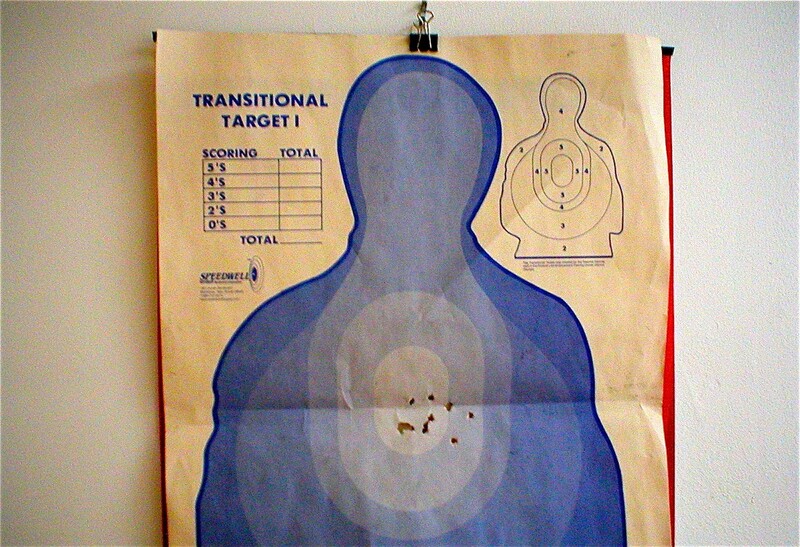 Years ago, a friend took me to a shooting range in, of all places, Manhattan. Although I grew up in a Texas town where hunting was so commonplace that one of the three choices for our eighth-grade woodshop project was a gun cabinet, it was the first time I’d pulled the trigger of a real firearm. It was a gentle introduction, involving minimal-recoil .22 caliber rifles. But not surprisingly, I was pretty bad. Mostly I remember firing at concentric-circle targets from various distances, and my shots tending to hit the outer edges. There was one exception: When we switched to a target featuring a vaguely human shape, my accuracy improved dramatically. This made an impression on me. I kept the target. It’s a compelling object. Not my target, per se, but targets in general — and especially those depicting or suggesting a human form. Apart from being quietly iconic (we instantly recognize these things for what they are), they’re vaguely chilling. The design’s function is to improve shooting accuracy. And the undeniable subtext is to promote the skilled use of a gun to inflict damage on another person. The specific image depicted on a target can be, you might say, a loaded design decision. And it’s one we respond to here in a novel way. This essay is accompanied by its own limited-edition object, created by designer Tim Belonax. If you act fast, you could own his creation, for free: We’re giving them to the first 50 readers to tweet a link to the story with @ReadReform in the tweet. Details at the bottom of the post. But don’t just share this essay — read it! You’ll want the full back story. It includes a photographer’s revelatory project documenting shooting targets around the world — and an insightful conversation with a man who shot a friend for art. 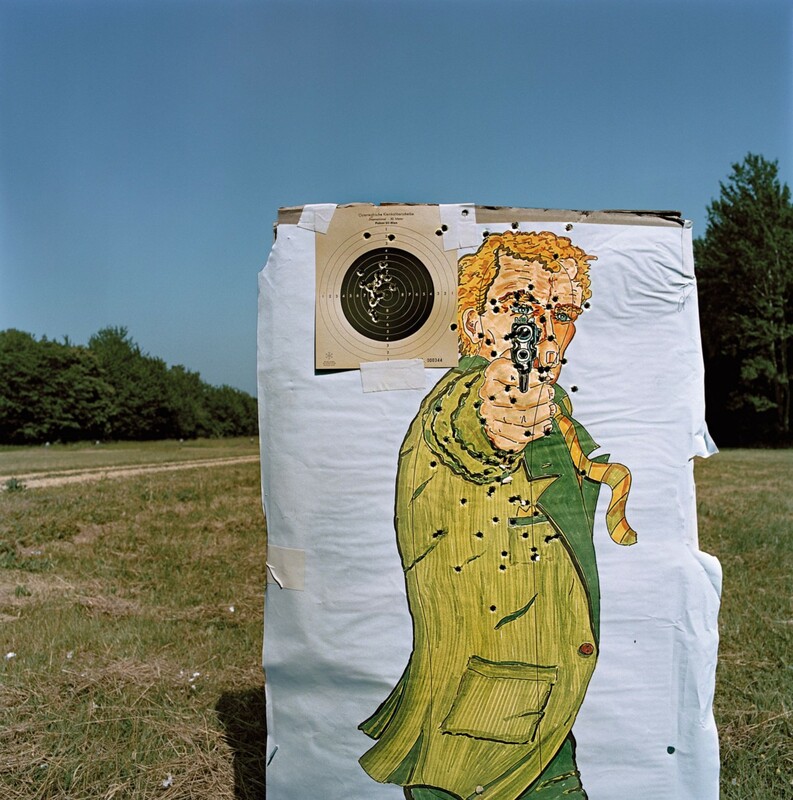 I was reminded of my minor shooting adventure — and the broader idea of what targets really mean — after learning about photographer Herlinde Koelbl’s project, and book, Targets. Over a period of years, Koelbl visited nearly 30 countries, with the aim of documenting a specific iteration of the target idea. This may not have been Koelbl’s agenda, but her book made me realize that while the shooting-range target is clearly a designed object, it’s one that is really not intended for wider public consideration. Yet the graphic creativity that’s gone into the making of targets around the world is perversely dazzling. It’s fascinating to note a target design used by British, South African, and Mongolian soldiers, “as if they had all been ordered from the same catalog,” as Koelbl observes. But it’s the startling variety of solutions to the challenge of target design that makes a lasting impression. 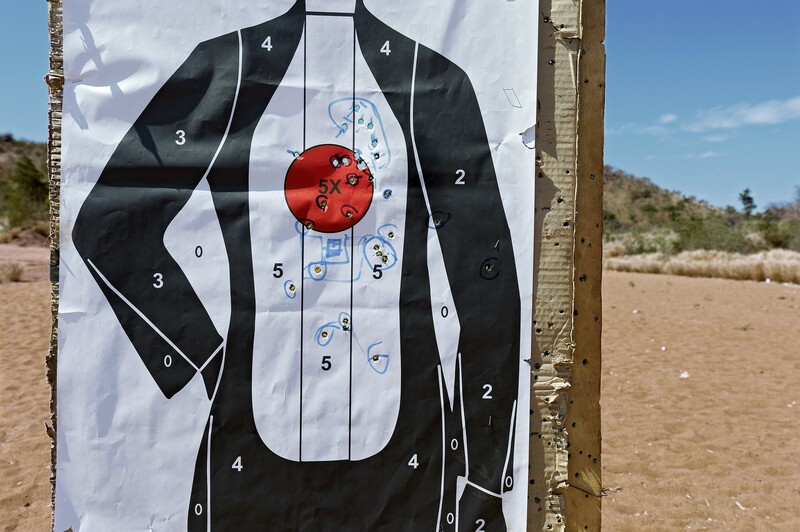 The challenge of designing a good target in this context is not trivial: Shooting skill can be a life-or-death matter for a combat soldier. 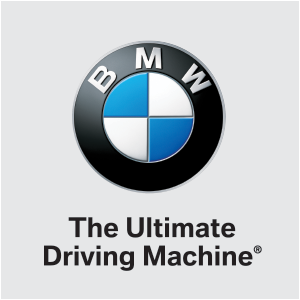 Thus the form and function of their training tools matter as much as any design project can. And clearly, many efforts have been made. Occasionally, the result is an abstraction. A target in Japan is a square divided in two horizontal color halves, red above, white below; in Poland, soldiers aim at a starkly simple convergence of lines on a central circle. But mostly, the solution involves the blunt invocation of a person — presumably an enemy. In Mali, a human-ish figure is divided into point zones. In Ethiopia, a ghostly abstraction would look childishly charming if it weren’t riddled with bullet holes. 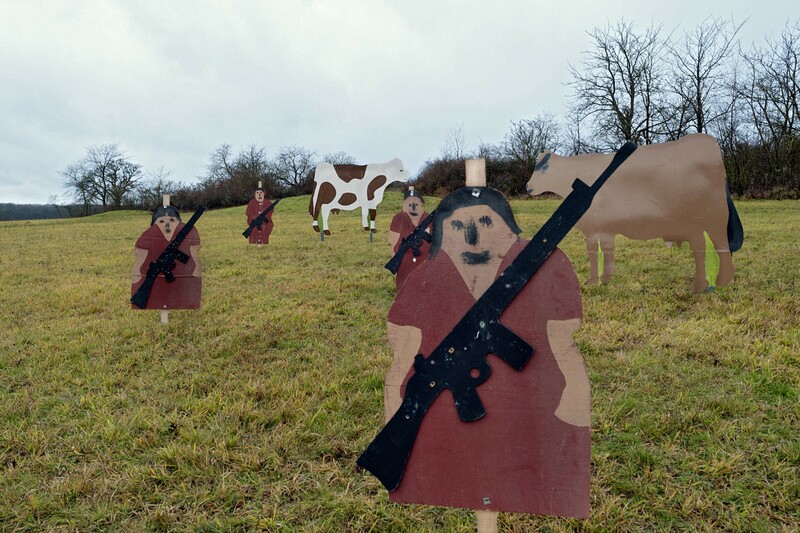 In Lebanon, a soldier stands between targets depicting a cartoonish woman brandishing a huge pistol. In Norway, we see a target showing a photograph of a man holding a woman at gunpoint. And in the United States, there is a photorealistic man with a machine gun, his face mostly obscured by a red-and-white keffiyeh, and a mannequin obscured within an Aeropostale hoodie. 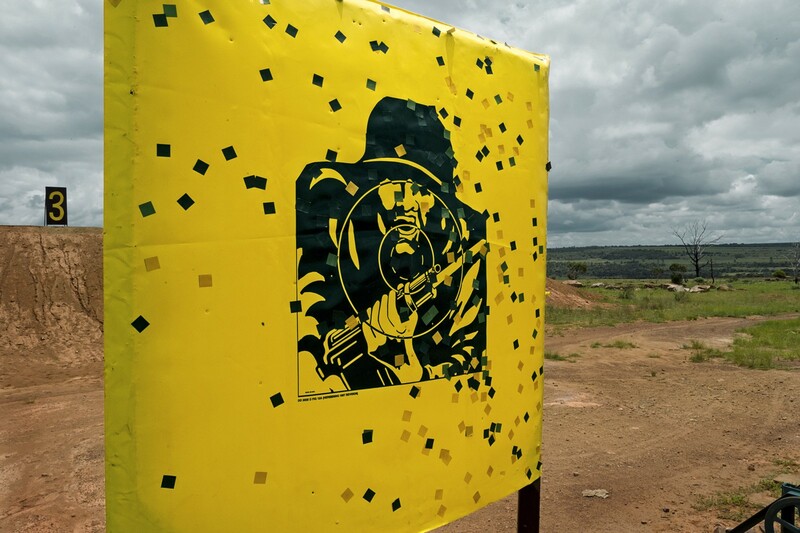 Of course targets used to train soldiers to kill are an extreme use case. But by and large the target-as-object is designed to aid lethal skills. Maybe the figure depicted isn’t a mortal enemy, just an intruder or “bad guy.” What does the designer use to represent this killable entity? The New York Times once entertainingly pursued a specific instance of how that question has been answered with a lengthy attempt to determine who, exactly, “Cops’ Favorite Target Thug” might have been. These objects are, to me, both impressive and unnerving. I admire the range of creativity. I despair at the ultimate goal. Targets, then, are a reminder that “design” is merely an activity, a means to an end that may be wonderful, but may just as easily be grim. All easy enough to say. But maybe this is an instance where it’s more useful to respond not with words about design, but with design itself. I conferred with designer Tim Belonax. I assumed he’d have interesting things to say: I’ve admired his projects, from a clever collaboration with The Thing, the unique object-art quarterly, through his recent book of self-assignments, The Reward Is In The Process. If you don’t know it, the piece involves … Burden getting shot. You can watch the wildly anticlimactic video on YouTube. “In ‘Shoot,’ I’m shot in the upper left-hand arm by a friend of mine,” Burden deadpans in a voiceover. The artist was shot, by the by, with a .22 caliber rifle. But who, I wondered, was this friend? Imagine the pressure on this shooter! If he proved inaccurate, he could kill a friend. 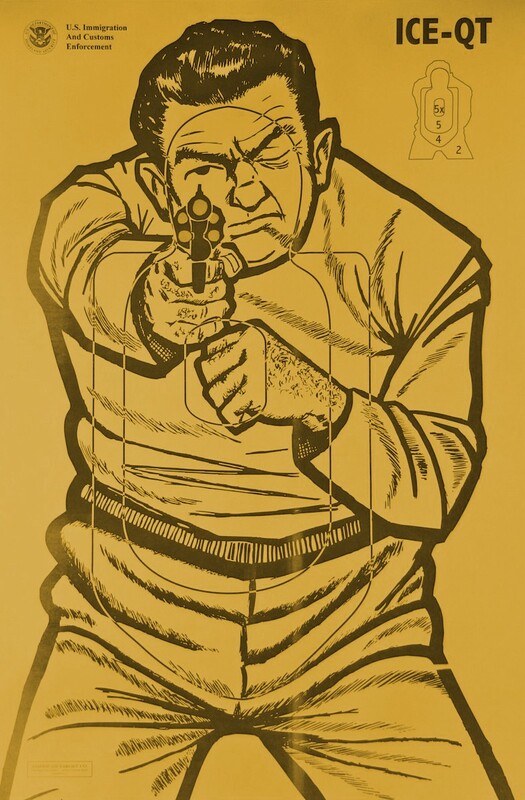 To me, this shooter seemed like an unsung hero in the history of non-lethal shooting (and of art). 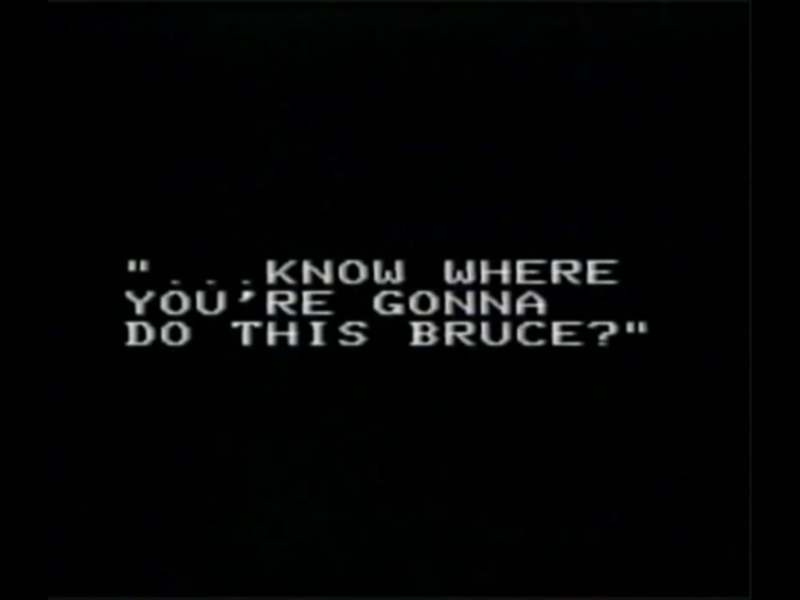 His name is Bruce Dunlap. These days he’s a partner in a regional CPA firm in Carmel, California. We conferred by email about his experience. Drafted into the Army in the mid 1960s, shortly after finishing his undergraduate degree as the Vietnam era was escalating, he learned to shoot as part of his basic training at Fort Dix, in New Jersey. He was never called overseas, and upon his discharge went to art school via the G.I. Bill — at the University of California, Irvine, where he became friends with Burden. Screen grab from “Shoot” documentation video. So was he scared? “I was not scared of the piece so much as what could happen to me living in Orange County, California, in the early 70s if things went haywire and the police got involved,” he answers. And indeed, it was agreed that the identity of the shooter would be released only when Dunlap was comfortable. 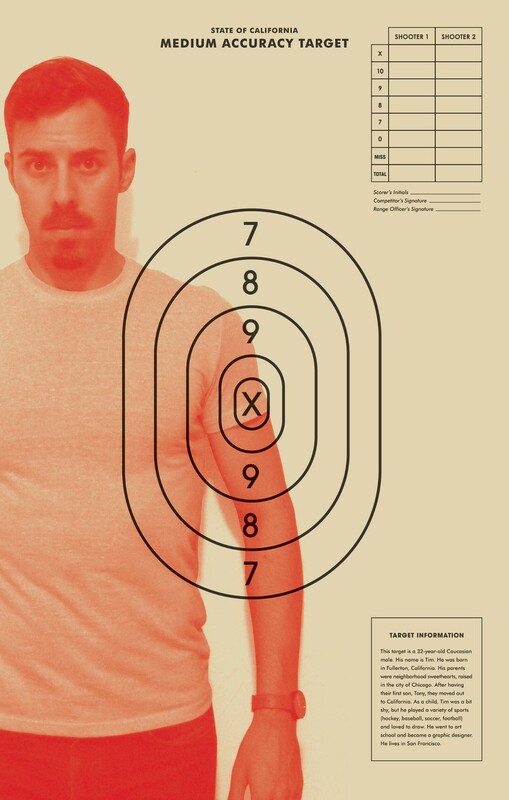 Dunlap’s experience seemed like a useful starting point for inspiring an object that offered its own critique of target design — the idea of honing the gun skill to shoot a friend potentially redefines the skill-enhancing object. Belonax, of course, has his own thoughts. Usually, Belonax observes, targets depicting human forms essentially turn those forms into some sort of cartoonish, anonymous, and essentially dehumanized “villain.” So he went the opposite direction, rehumanizing the target by using a photo of a specific individual (who wears a somewhat nervous expression) with “a brief life description,” he explains, “in an attempt to influence empathy and give a real identity to the target. In short, here we have a target that subverts the traditional meaning of a target. And I have to say, I think it really hits the mark. Poster specs: Paper: French 80# “Old Green” Speckletone cover. Size: 14"x 22". Inks: Fire Red, Black. Prints will be signed and numbered by the designer. Thanks to Paul Lukas for taking me on that shooting-range adventure back in 2005; read his related story here. And thanks to Randy Kennedy for knowing the name of the “Shoot” shooter; read his 2013 article about Chris Burden here.